Our contemporary styled fixed rooflight is structurally silicone glazed ensuring a complete factory finished, fully watertight product with a high quality, elegant appearance. 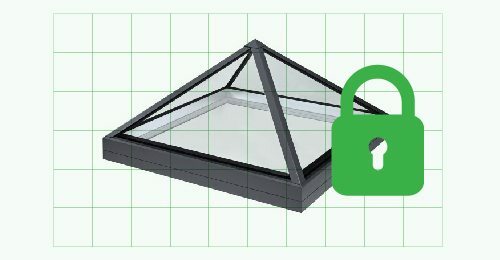 Our roof lanterns are manufactured using state of the art structural silicone glazing techniques. These techniques allow the production of a 30 degree low pitch frameless roof lantern without the need for internal framework to the hips or ridge, creating one of the slimmest roof lanterns on the market. Our Octagonal roof lantern is low pitch and frameless adopting the same technology as our lantern and pyramid rooflights which means it has no internal hip framework ensuring that the maximum amount of natural light is able to penetrate the room beneath. Our pyramid rooflight is frameless in design with glass set at a 30 degree angle to create a low pitch pyramid rooflight that uses the same technology as our roof lantern. This means that it has no internal hip framework ensuring that the maximum amount of natural light is able to penetrate the room beneath. Designed to be installed within a pitch range of between 10° and 70°. 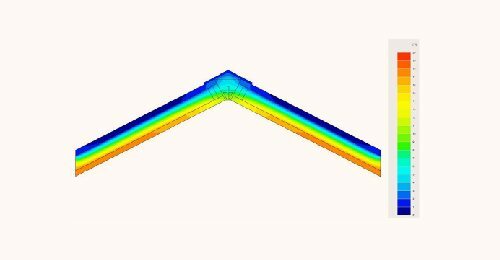 If required this product can accommodate asymmetrical roof pitches and can also incorporate different rooflight slope lengths on either side. Our fixed circular rooflights are structurally silicone glazed to give a sleek, elegant appearance with exceptional strength and rigidity. 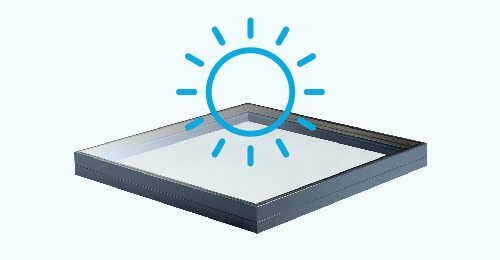 The Duplus walk on rooflight is designed to be flush with surrounding flooring, typically on roof terraces with decking. For a Duplus walk on rooflight a builders kerb is required for this product. Our contemporary styled fixed octagonal rooflight is structurally silicone glazed ensuring a complete factory finished, fully watertight product with a high quality, elegant appearance. 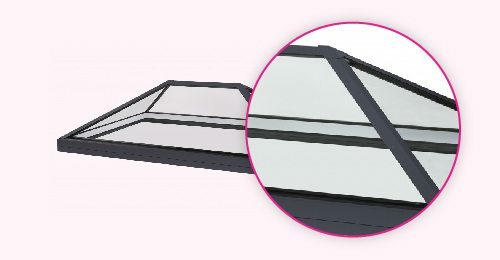 Our contemporary styled fixed triangular rooflight is structurally silicone glazed ensuring a complete factory finished, fully watertight product with a high quality, elegant appearance. Primarily designed for larger roof lanterns between 3500mm and 5800mm in length, our accredited structural silicone glazing techniques allow a design identical to our smaller lanterns but with the introduction of a centre ultra slim rafter but without the requirement for internal framework to the products hips or ridge. This product is primarily used where there is a requirement for a lantern rooflight design but with a wall abutment. This allows maximum natural light to penetrate into darker spaces of the room, particularly rooms that have been extended. Our contemporary styled fixed glass rooflight is structurally silicone glazed ensuring a complete factory finished, fully watertight product with a high quality, elegant appearance. Our high performance opening rooflights are available to open manually or by electric control. Manually opening rooflights are fitted with a chrome screwjack which is operated using a separate winding pole. Our accredited structural silicone glazing techniques allow the production of a glass lantern rooflight without the requirement for internal framework to the products hips or ridge. Our pyramid rooflight uses the same technology as our lantern rooflight which means it has no internal hip framework ensuring that the maximum amount of natural light is able to penetrate the room beneath. Our contemporary styled modular rooflight is structurally silicone glazed ensuring a complete factory finished, fully watertight product with a high quality, elegant appearance. Our rooflights are made to the highest of standards and come full of features. Frameless hips and ridge – Glass to glass joints internally creates a sleek frameless aesthetic. BRE tested to BS EN 14351-1:2006 +A1:2010 clauses 4.2, 4.5 and 4.14. High resistance to condensation under normal conditions compared to framed versions. Building Regulations Part Q compliant solution available. Want to know more about Duplus and our range of rooflights, request our brochure and we’ll send you an email. No thanks, just the brochure please.